Lush is a brand everyone is familiar with. It’s natural, organic and cruelty free. I have been a fan of it since I tried their fresh face mask Oatifix about 2.5 years ago. That mask contained fresh bananas, fine oatmeal, ground almonds and more. My skin felt amazing using it!. 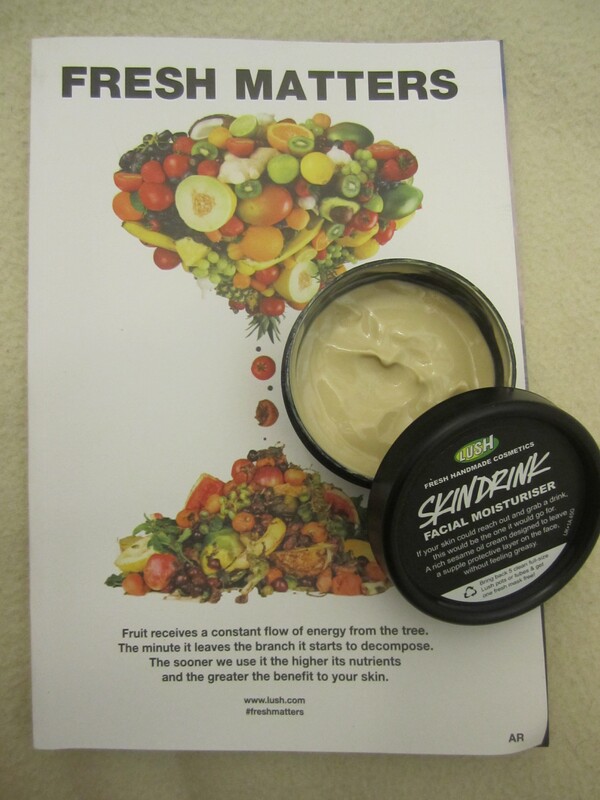 But today’s review is about Skin Drink, which is a facial moisturizer. What attracted me the most to this product is that it contains fresh Avocados and Aloe vera. These both are immensely beneficial to our skin. My skin type is normal but leaning towards dry. So, I felt this would be a perfect addition to my skincare routine. I have been using this product for a little over 2 months now and am only half way into the tub as you can see below. It lasts a LONG time and a little goes a long way. The product is very creamy, rich yet light and gets easily absorbed into the skin. It leaves your skin feeling satin like and supple. I have got to say, it’s a bit on the oilier side than most facial moisturizers, because of the wide variety of oils incorporated into it. When used alone, it doesn’t show up a lot though. But when I combined it with other products in my skincare routine, I got a slightly oily shine on my face in the end. It definitely isn’t greasy though. You can use it anytime of the day however I use it in the night. Though it gives me a shiny face at night, in the morning, I wake up to beautifully hydrated and supple face!. The dominant smell of this product is that of sesame, because of the organic sesame oil in it!. The color is beige. It looks and smells exactly like tahini!. Inorder to tone down the nutty smell, they have added infusion of fresh rose petals, rose absolute and neroli essential oil. Still, some might find the smell too strong. However, I like sesame’s smell and thus overall, I found it to be pleasant. The smell doesn’t linger on for long anyway. I received a book called ‘Fresh Matters’ along with this product. Oh my god!. I love this book. It lists ALL the products of Lush, it’s ingredients and it’s usage directions. 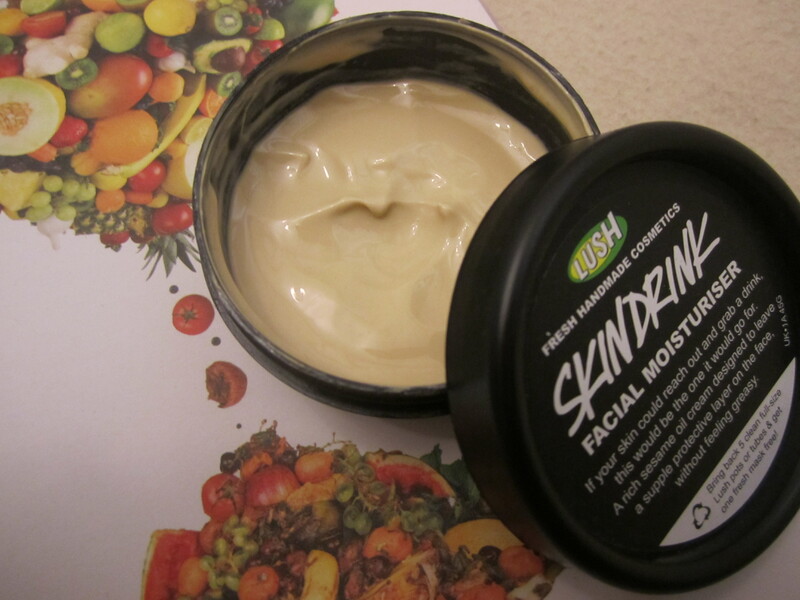 I am in awe of the wonderful organic products incorporated into this face moisturizer!. The ingredients are : Organic sesame oil, Avocados, Fresh Rose Petal Infusion, Almond Oil, Cocoa Butter, Aloe Vera Extract, Organic Aloe Vera Gel, Evening Primrose Oil , Neroli Oil and Rose Absolute (derived from Damask roses)!. It comes in a black plastic tub, unique to Lush. I always love products that come with a pump, so that it’s totally hygienic. However, in this case, I don’t quite mind that the packaging is so simplistic, since Lush is into recycling and being more eco-friendly, which I really respect. I just make sure my fingers are absolutely clean before dipping into it. The tub contains 45gms and costs AED135. 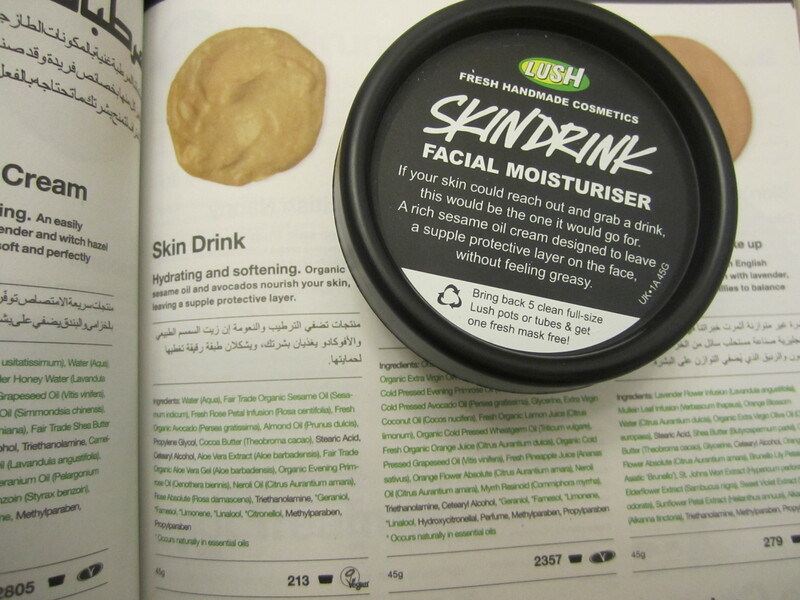 You can purchase this either online at www.lush.ae or in one of their numerous stores here in UAE or worldwide. If you are on the lookout for a hydrating and protecting facial moisturizer, this is the one to go for. I highly recommend it. Your skin won’t be disappointed!. From reviews I read even before getting this product, I believe this is good for all skin types, though personally I feel it’s best for dry skin. My skin is normal at the moment but dry in winters. I can’t wait to use this in winter and am sure at that time, it wont feel to be on the oilier side. Note: I was provided this product for review purpose and all opinions are 100% my own.